During a teleconference with the media to talk about this weekend’s Rolex 24 at Daytona, Hurley Haywood and Scott Pruett were asked about the current status of the sport in America. Particularly, the status of the Rolex GRAND-AM Series. And specifically; where is it vis a vis the IMSA era – the era which many view as the heyday of sports car racing – these days? Both Haywood and Pruett indicated that they believe that these – right now – may be the golden days. They listed two criteria for that belief. The first was the quality of the racing/competition itself. Pruett said it has never been better than it is right now for prototypes. He brought up the fact that the recent races at Daytona were thrillingly close. Like seconds between the top cars, not laps. The new DP Corvettes are fast and good looking. “Last year the green flag and white flag flew at the same time, and we had five-car shootout for the victory,” Pruett, who won that shootout in his Chip Ganassi Racing BMW Riley, said. “The year before that we had two cars going at it, three cars going at it. The year before that first and second was only separated by seconds. And I think that’s incredible. It is a point well-taken. 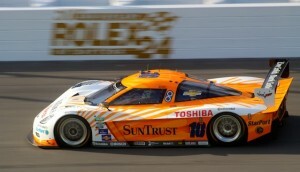 Recent races at Daytona – and other venues – have provided superb racing and gripping excitement. And even though the original point of endurance racing was as much about testing the drivers/machine’s ability to sustain long-term, high-demand abuse and feature the excitement of “will they make it?”, tight racing is always cool to view. But among sports car fans, excitement is not strictly measured in time and distance. For sports car fans, much of the buzz comes from the machinery in the prototype classes. The more exotic, the more high-tech, the cooler-looking, the better. In fact, no, not just “the better”. For sports car purists, particularly those whose roots snake their way back to the old IMSA days, cool machinery is essential. 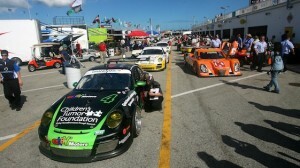 The paddock at Daytona is filled with nice cars this weekend. Jaguars, of the 1980s; and even the ALMS Peugeots, and Audis of this decade all had that technical, visual and visceral punch that was so strong, that close racing was of lesser importance. Just seeing them in the paddocks before the race, and blowing past during the race, was enough to hold interest for 12 and 24 hours at a time. Haywood, who raced back in those heydays, says the machinery being put on the track in GRAND-AM these days gets a bad rap. And Haywood, who will drive at Porsche 911 GT car this weekend, is absolutely correct when he says that the expensive, factory-backed prototypes of the last century might be gone forever because they have become numbingly expensive to build and race. Case in point, he said: Peugeot. Gone this year from prototype racing. Audi’s future? That’s tough to say but factory efforts tend to come and go. Some view that as a pity. Some will be watching the 24 this weekend and, unfortunately, find themselves thinking about races, cars and drivers of decades ago: Cars which, and drivers who, are at Daytona today as part of the race’s 50th anniversary celebration. But watching the world will be today. It’s the freakin’ Rolex 24. Fifty years of sports car racing at Daytona International Speedway have been marked by an incredible list of milestones, all part of the golden anniversary weekend of North America’s premier endurance race. 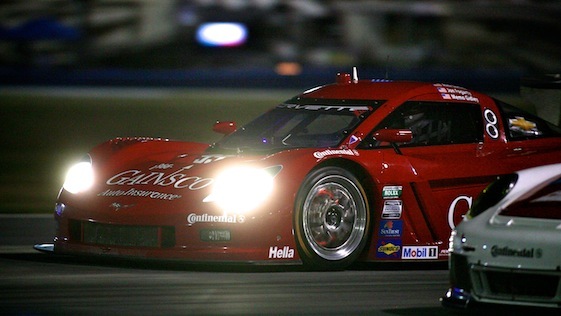 3 – Only Rolf Stommelen (1960s, 1970s and 1980s) and Scott Pruett (1990s, 2000s and 2010s) have won the overall Rolex 24 title in three different decades. 5 – Porsche ace Hurley Haywood’s record number of overall Rolex 24 victories. 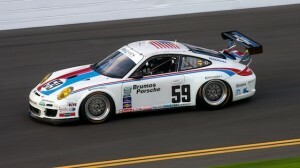 Hurley Haywood is back for another run in the Brumos Porsche. 10 – Rolex clocks located throughout the property at Daytona International Speedway _ nine free-standing clocks and a 25-foot tall, four-sided clock on pit road. $10 – Grandstand admission to the race after 6 p.m. on Saturday. 18 – Time span, in years, between Hurley Haywood’s first and last victories in the Rolex 24 (1973-91). 21 – Different countries represented among Rolex 24 overall champions. 22 – Overall victories posted by various Porsche models in the Rolex 24, most by any marque. 29 – Past champion cars on display this weekend in the 50 Years of Champions Exhibit Presented by Continental Tire. 38 – Career starts in the Rolex 24 by Hurley Haywood, most among any driver. 47 – Past champion drivers in attendance for this weekend’s Rolex 24. 66 – Overall Rolex 24 victories delivered by drivers from the United States, most among any country. 82 – Starting car-count for the 1984 Rolex 24, most in history of the classic. 394 – Fewest laps by an overall winning car, turned by Hurley Haywood and Peter Gregg in a Porsche Carrera en route to victory in the 1973 Rolex 24. 762 – Most laps by an overall winning car, turned by Masahiro Hasemi, Kazuyoshi Hoshino and Toshio Suzuki in a Nissan R91 CP en route to victory in the 1992 Rolex 24. 31,404 – Number of combined laps completed in the 50-year history of the Rolex 24. 115,093.2 – Number of miles completed in the 50-year history of the Rolex 24.